America’s overall quality of life depends on the collective human services provided by nearly one million charitable-philanthropic-nonprofit organizations. The charitable-philanthropic/nonprofit sector is the most rapidly growing and changing economic and organizational domain in the world — a universe of voluntary associations and organizations representing civil society, philanthropy, and voluntary action. The Voluntary Sector has more than doubled since publication in 1980 of the first handbook recognizing the new professional field of “nonprofit organization management” (Connors, 1980). It has become a universe of voluntary associations and organizations representing civil society, philanthropy, and voluntary action. There are over one million charitable organizations contributing to America’s quality of life. America’s future quality of life will depend in large part on the ability of its more than one million charitable-philanthropic-nonprofit organizations to collectively provide a myriad of human services ranging from arts and education, to health, advocacy and social services. Sustaining our national quality of life in the face of expanding needs and dwindling resources will require significant improvements by our voluntary organizations in mission fulfillment, performance, productivity, and human services delivery. These voluntary organizations must deliver a myriad of human services in the face of ever-changing operating environments, compounded by the ever-growing demands for social human services needed to sustain our nation’s overall quality of life, and further complicated by growing calls for improved Effectiveness, Efficiency, Transparency and Accountability. Achieving improvements in overall effectiveness and efficiency resulting in substantially improved performance, results and outcomes will be among the most pressing challenges facing C-P/NP’s as transformational organizations. Nonprofit organizations are under increasing pressure to improve their delivery of public and human services. These have been called the “tides of reform,” and include calls for improved effectiveness, efficiency, and the organizational environment needed to achieve and sustain superior organizational performance in the face of ever changing environments. Until relatively recently, providing lower-cost or even no-cost human services, most of them through dedicated volunteers, was itself justification for a charity’s existence. However, for over three decades, charitable and philanthropic organizations across the United States have faced growing demands from the general public – and funding sources – for increased efficiency and effectiveness, accountability, and transparency (E/EAT). As Carman (2007-2009) pointed out, accountability emphases at the federal level and by large donor organizations (e.g., United Way) are changing financial management behavior by nonprofit organizations. Increasingly, nonprofit boards and senior governance leaders are challenged by demands for more program evaluation, more performance measurement, more assessment of outcomes and results, and demonstrated use of planning and evaluation approaches such as logic models. As Carman (2010) explained, nonprofit organizations face increasing pressures from funding sources demanding more evidence and proof they are achieving measurable outcomes, i.e., effective. These demands and requirements for additional substantiation require precious time, scarce resources, and evaluation expertise often not readily available. Increasingly, nonprofits expect to be asked by funders to show results, particularly in human services programming, and particularly where public monies are involved. The findings of Connors’ Charitable-Philanthropic Organization Self-Renewing Management Model (C-POSRM) Study (2013) confirm the conclusions reached by Van Til (2005) that nonprofit organizations are affected by constantly evolving operating environments reflecting: cultural forces, social and demographic conditions, government, media, donors and beneficiaries. Charitable-philanthropic organizations do perceive and report significant pressures from national sources to improve their overall organizational performance to be more accountable, effective, efficient, and transparent (E/EAT). Education organizations perceive themselves to be under the greatest pressures. Religion-related organizations were the least likely to report such pressures. Significantly, the strongest motivations for organizational improvement by charitable-philanthropic-nonprofit organizations were based on organizational pride and core values: most charitable organizations want to change in ways that enable them to better fulfill their public services missions and purposes. 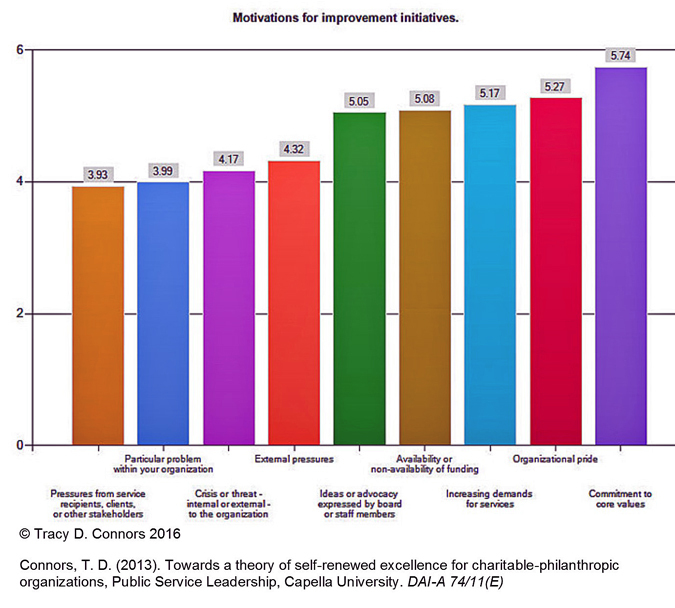 Figure 1 Motivations for improvement initiatives within charitable organizations. Source: Charitable-Philanthropic Organization Self-Renewing Management Model Study (Connors, 2013). C-NPO’s must increase their capacity in ways that are directly linked to outcomes and results demonstrating improved mission and public purpose accomplishment. “The [nonprofit] sector is under increased scrutiny from its funders, regulatory bodies, and the general public due to questions of inappropriate conduct and scandals in the nonprofit and for-profit sectors” Gollmar (and many others have) pointed out. “Nonprofits must demonstrate their effectiveness.” Organizational effectiveness is directly linked to capacity building-those activities that an organization engages in to better achieve its mission” (Gollmar, 2008, p. 1). Typical capacity building activities for nonprofits encompass a wide range, from strategic planning, media relations and staff diversity, to succession planning, information technology, and staff training. In most cases, just “doing something” has some positive effects and benefits (Gollmar, 2008). However, the tightening economic and oversight environment does not support fundamentally “hit or miss” initiatives using “public” funds. A stronger, more supportable rationale for capacity building initiatives is needed.